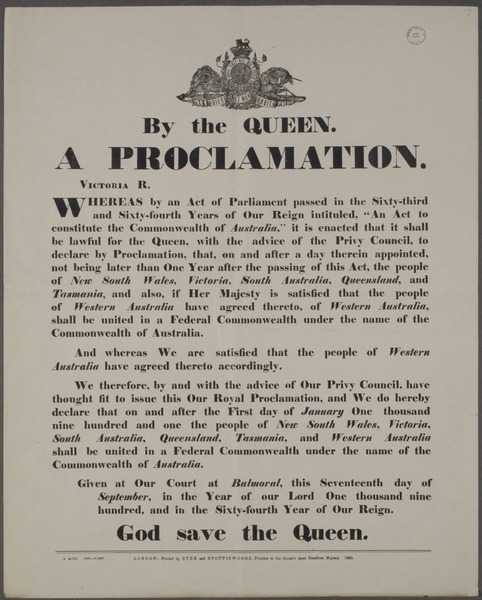 A proclamation whereas by an Act of Parliament passed in the Sixty-third and Sixty-fourth years of our reign intituled, “An act to constitute the Commonwealth of Australia” … / by the Queen, Victoria R.
On this day, 9 July 1900, Queen Victoria approved the Commonwealth of Australia Constitution Bill. Prior to 1901, Australia was made up of six colonies which had partial self-government, but which were also under British authority. Although the continent had officially been known as Australia since 1824, there was no nation or government of Australia. The Federation movement gained momentum during the 1880s, but before Federation could occur, it was necessary to draft an Australian Constitution - a process which took almost a decade. Interestingly, Western Australia only agreed to the bill several weeks after it was given Royal Assent, but the Act made provision for Western Australia to still join the Commonwealth. On 1 January 1901, federation of the six colonies was achieved and the Commonwealth of Australia was proclaimed.